A film with a long history of production problems. It was initially supposed to be a TV mini-series but it was edited down to a 90 minutes or so 'film.' I put film in quotation marks because the end result is a confusing mess. The film is well shot and Lou is in top form but wow, it's bad! I agree entirely! 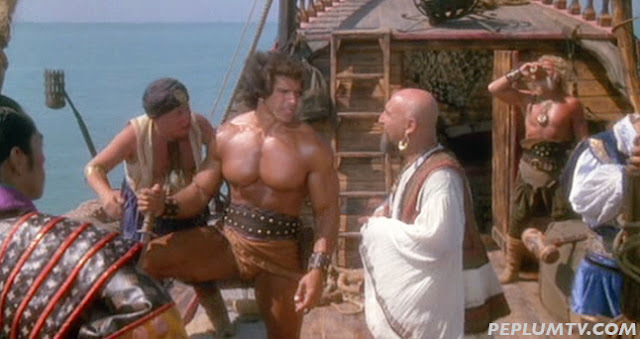 This is one of the worst Sinbad movies ever made. I don't know if you know but, at Amazon, exists a dvd about golden age peplum stars: "UOMINI FORTI". It seems interesting and very amusing. This is a sometimes pretty-looking lunk-headed mess. I rented this film ages ago at Blockbuster Video, and was both amused and confused. I like this better than Lou Ferrigno's Hercules movies though. I feel like this has more charm and humor to it.